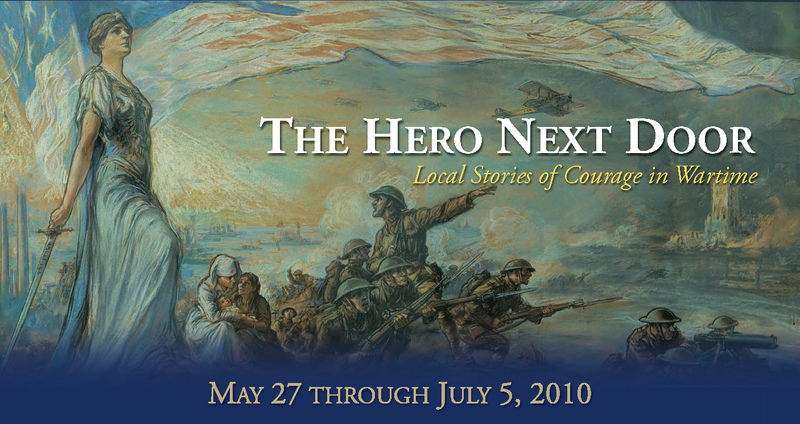 The OSilas Gallery at Concordia College is pleased to announce “The Hero Next Door; Local Stories of Courage in Wartime”on view May 27th through July 5, 2010. The exhibition will open with a reception for the public on Thursday, May 27, at 7 pm, and will feature a collection of personal stories of more than 70 Bronxville, Eastchester & Tuckahoe men and women who died in the service of our Country in World War I, World War II, Korea and Viet Nam. In addition to individual stories remembering these courageous heroes, the exhibition will include large model planes of the period such as, recruiting posters from the Eastchester Historical Society, newspaper pages from World War II, maps and other military service ephemera. American Flags from the collection of Town Councilwoman Sheila Marcotte will be on view, including rare examples of Americana from the revolution through the current times. The memorial stories have been assembled by Michael Fix of Eastchester, a local historian, Vietnam era veteran, and one of the eight Founders of Westover Air force Base USO during Desert Storm/Desert Shield, who has spent years researching, collecting, and recording the lives and sacrifices of the lost local soldier. Local records estimate that there are at least 120 people who died in those four conflicts. These memory plaques hang at the LeRoy Gregory American Legion Post when not traveling on exhibit. We will celebrate the Memorial Day weekend with representations from the four last wars of the 20th Century, bringing together people of all ages to celebrate, and remember, those who came before them. The exhibition hopes to spark an interest for those who were not alive during these conflicts, rekindle the memories of the people alive to remember them, and remind us of our men and women in conflict around the world today. Two days before Flag Day, the American Legion and Veterans of Foreign Wars will sponsor a Flag Burning in the front quad of Concordia. All flags that are torn or stained that citizens would like to have destroyed may be brought to Eastchester Town Hall, Bronxville Town Hall or Tuckahoe Town Hall for pick up and burning, in proper ceremony for the disposal of the American flag. The Jazz Knights of West Point will perform in a special concert at Concordia. The Jazz Knights are the official swing band of the Military Academy and will be playing musical favorites of all the different wars and periods of the past as well as contemporary numbers.